Mid- and far-infrared observations of the environment around embedded protostars reveal a plethora of high excitation molecular and atomic emission lines. 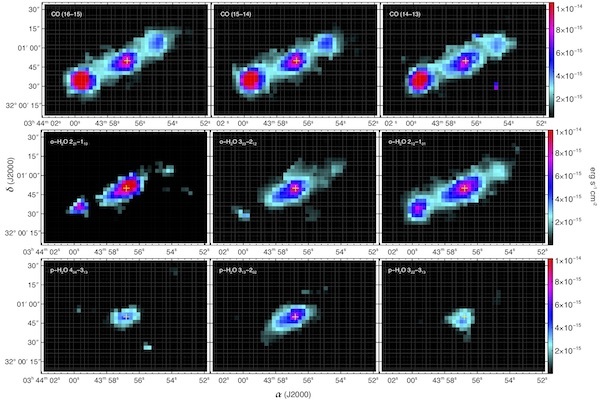 In this paper recently accepted for publication in Astronomy & Astrophysics we present spectro-imaging observations of the HH211 system with Herschel/PACS that record emission from major molecular (CO, H2O and OH) and atomic coolants (e.g. [OI]). Molecular lines are mainly exited at the terminal bowshocks of the outflow and around the position of the protostar. From top to bottom: Carbon monoxide, ortho- and para- water lines tracing different excitation mechanisms in the vicinity of HH211. All lines show maxima at the southeast bowshock with the exception of water emission that peaks around the central source. Excitation analysis in all positions shows that CO and H2O are mainly thermally excited at T~ 350 K and 90 K respectively, with the CO showing a second temperature component at 750 K towards the southeast peak. Excitation analysis breaks down in the case of OH, indicating that the molecule is non-thermally excited. Comparisons between the CO and H2 column densities suggest that the CO abundance value in shocks can be up to an order of magnitude lower than the canonical value of 10−4. The water ortho-to-para ratio around the protostar is only 0.65, indicating low-temperature water ice formation followed by non-destructive photodesorption from the dust grains. Therefore the low ortho-to-para ratio in water that can be interpreted in terms of formation from a primordial gas reservoir in the protostellar envelope. The two-sided total atomic mass flux estimated from the [OI] jet sums to 1.65×10−6 M⊙ yr−1, a value that is very close to the mass flux previously estimated for the SiO jet and the H2 outflow. These comparisons render HH211 the first embedded system where an atomic jet is demonstrably shown to possess enough momentum to drive the observed molecular jets and large scale outflows.